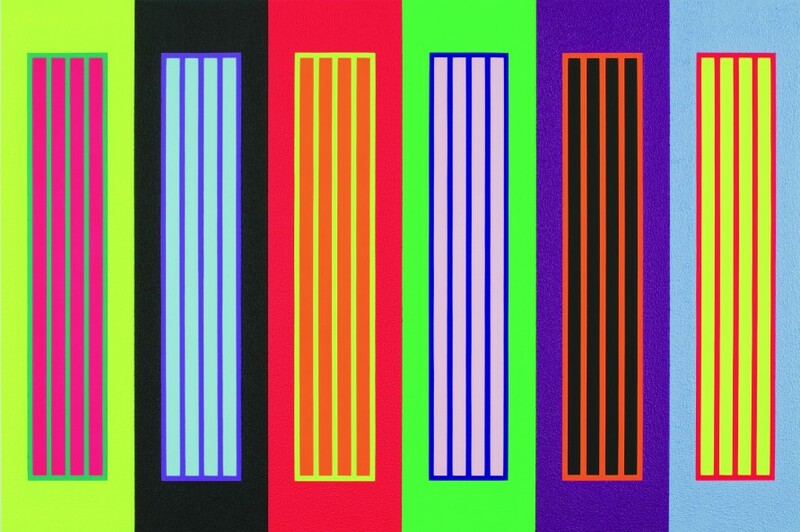 Peter Halley, Laws of Rock, 2008, acrylic, fluorescent acrylic, and roll-a-tex on canvas, 75 in. x 112.5 in., Tatintsian Collection. With paintings from major public and private collections, Peter Halley: Big Paintings is a focused look at some of the artist's most monumental paintings spanning his career from the 1980s to the present day. The exhibition of nine monumental paintings highlights the evolution of Halley's bold style and the sophistication of his ideas. Using synthetic pigments and textured surfaces, American artist Peter Halley composes his paintings with a precise set of geometric icons-solid cells, gridded prisons, and linear conduits-that appear in different guises over the course of his career. Connecticut has played an important part in Halley's life and career. He came to Connecticut first as an undergraduate at Yale, and later was a professor in and director for the graduate painting program at the Yale School of Art from 1999-2011. The museum is publishing a catalogue of the same title to accompany the exhibition.